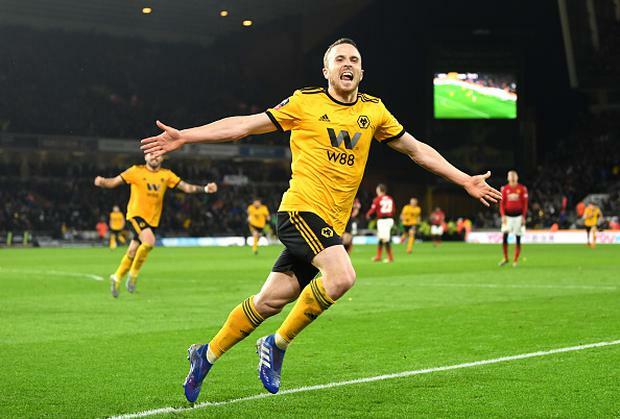 Raul Jimenez and Diogo Jota sent Wolves into the semi-finals of the FA Cup for the first time in 21 years after a 2-1 win over Manchester United. The duo's goals dumped United out as Nuno Espirito Santo's side deservedly booked a Wembley date next month, despite Marcus Rashford's late consolation. United never convinced and could have lost by more, with Sergio Romero turning Jimenez's header on to the bar and denying Jota. But the pair scored twice in quick succession in the second half at Molineux as Ole Gunnar Solskjaer's men crashed out, in their worst display under their temporary boss. Victor Lindelof was also spared a late red card after a VAR review. The 12-time winners controlled the opening skirmishes and Paul Pogba, skipper after being told by former manager Jose Mourinho he would never captain the club again, dragged a tame effort wide after 10 minutes. The ambitious Rashford then tested John Ruddy from 40 yards with little luck. The visitors dominated possession without hurting the hosts, who struggled to find their own rhythm but kept United at bay without too much trouble. Wolves were seeking a first win over United since 2011 and Ruben Neves had their first attempt after 28 minutes, but Romero claimed his low drive from a neat corner. Jota then miscued a volley straight at Romero as Wolves began to test Solskjaer's men. United were patient in possession, with Rashford's bustling endeavour a nuisance, but they never convinced against their organised hosts. Their biggest threat came when Diogo Dalot's drive hit Jonny on the arm but referee Martin Atkinson correctly waved away their appeals. Clear-cut chances were at a premium but Wolves wasted their only serious opening of the first half three minutes before the break. United made a mess of their own corner and, when Wolves broke, Jota was played through by Neves only to be denied by the onrushing Romero. It was a big miss and Wolves almost paid the price immediately after the break when Rashford darted into the box but sliced wide. But it proved only a brief concern as the hosts slipped into gear for a near-faultless second-half performance. They nearly opened the scoring after 54 minutes when Jimenez met Joao Moutinho's corner with a powerful 10-yard header but Romero's brilliant reaction stop turned the ball onto the bar and over. The momentum was with the hosts and Romero pushed Moutinho's 25-yard effort over soon after. Pedestrian United were there for the taking and Wolves finally punished them with 20 minutes remaining. Moutinho found Jimenez after a strong run and the Mexico international held up the ball, getting lucky with a ricochet, to swivel and fire in his 15th goal of the season from 12 yards. Six minutes later shell-shocked United conceded again when Jota out-muscled Luke Shaw to race towards goal and arrow a low strike past Romero. And with eight minutes remaining Lindelof escaped a red card after initially being dismissed for a foul on Jota. VAR was controversially not in use at Swansea's tie with Manchester City earlier in the day but was deployed at Molineux to downgrade the Swede's punishment to a booking. Rashford then grabbed an injury-time consolation, shooting in low past Ruddy.